Stopping Down - Too close? Shooting at wildlife is mostly a matter of long lenses; especially if you're not a professional being able to afford such big guns as 600mm lenses paired with a 2x teleconverter, most of the time your subject is just too far. Most of the time, but not always. Today I was hunting for little grebes along a canal near Talamone, where I usually find some of them. I actually found a few ones, but wasn't able to get good shots. Driving on, the road parts from the canal and enters an area with fields and bushes. All of a sudden, I spotted a few wild boars just a few meters from me, in full light. I stopped the car and found myself in a good position - in the meantime, the animals were still eating, apparently not caring of my presence. They were close, even too close for the 300mm + 2x focal that I was using. Nikon D200 + Nikkor 300mm ƒ/4D ED-IF AF-S @ 600 mm, 1/320 sec @ ƒ/10, -1.00 EV, ISO 320, beanbag from the car. What to do? Unmounting the teleconverter requires a few seconds and wildlife is always unpredictable - they might look quiet for a while and then run away all of a sudden. In these cases, I prefer to first take some shots, just to be safe, and only later try to change the lens. A wise precaution: the wild boars decided to vanish after a few seconds, while I was changing the lens. Of course, the resulting shot was a tight crop on the subject. Given that you can't make for more room during post-processing, sometimes it makes sense to crop even more. 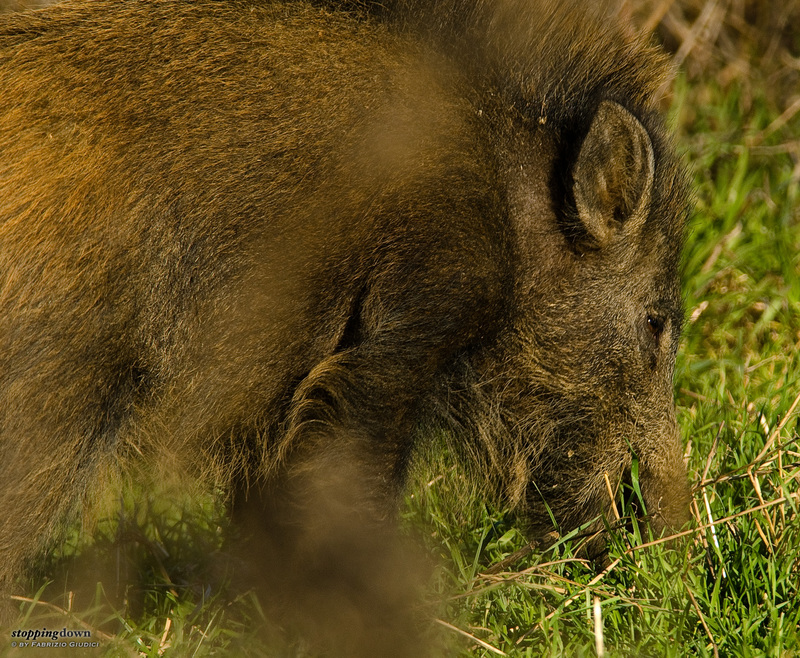 For instance, in the original shot I could see the wild boar touching the upper border of the photo, while the posterior legs were not visible: so I decided to apply a wilder crop as shown. Not only the crop is more coherent, but the resulting photo better conveys the feeling of closeness that I experienced on the field.